For those who missed "Building Minds: Microchips & Molecules", here is a taste of the action. For all who packed the CNSI auditorium in May for our annual interdisciplinary symposium, here is a quick trip down memory lane. Enjoy! 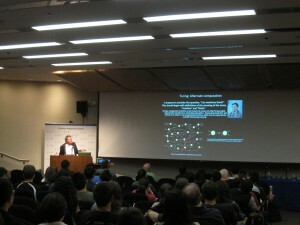 UCLA's James Gimzewski cited Alan Turing in his talk describing his research on computer chips that mimic human neural connections. Timothy Busbice shared video of his robot implementing the C. Elegans connectome, which holds promise for self-navigating mars rovers. Randal Koene shared the future of whole-brain emulation and mind uploading, and recent advances in the field. Brian Keeley discussed how we can enhance our existing senses and also develop new ones, such as for magnetic fields. After each of our speakers gave their individual talks, they engaged with audience questions in a lively panel discussion, moderated by UCLA Psychology's Dr. Martin Monti.